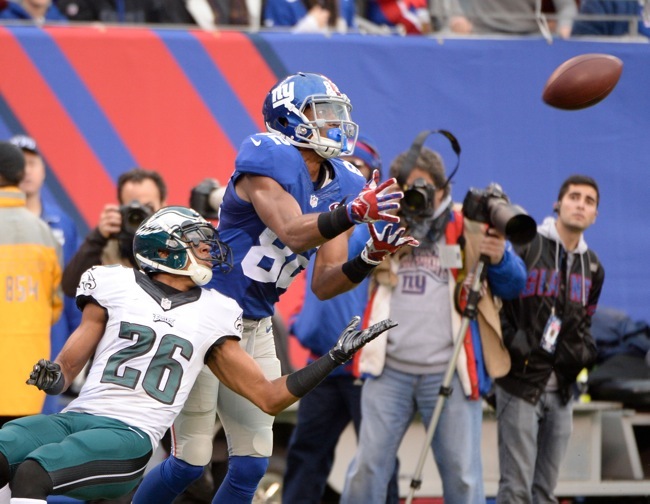 Unrestricted free agent wide receiver Rueben Randle has signed a 1-year contract with the Philadelphia Eagles. NJ.com is reporting that the deal is worth $1.025 million with potential to earn more through incentives. The NFL Network says the deal could be worth more than $3 million and includes $500,000 in guaranteed money. Randle had recently visited the Los Angeles Rams, but he did not receive a contract offer from the Rams. Randle, a 2nd round pick in the 2012 NFL Draft, remains a frustrating performer. With Victor Cruz unable to play in 2015, the Giants needed consistent productivity from Randle and did not get it. Indeed, despite starting all 16 games, his numbers dropped from 71 catches for 938 yards in 2014 to 57 catches for 797 yards in 2015. He did increase his touchdown total from three to eight. Randle is the third free agent to leave the Giants this month, joining cornerback Prince Amukamara (Jaguars) and defensive end Robert Ayers (Buccaneers). For a complete list of remaining unsigned unrestricted free agents, see the Free Agency Scorecard section of the website. On who might step up at safety: “(Nat) Berhe is definitely one of them. (Bennett) Jackson is one of them. There are a lot of guys who can factor in there. (Mykkele) Thompson. We’re going to get them healthy and get them out there and let them compete for it. We need to get them in and take a look at them, but to a certain degree they’ll each be able to contribute (in the spring workouts). A video of a Giants.com “Insider” interview with wide receiver Victor Cruz is available at Giants.com. The NFL Network reports that unrestricted free agent wide receiver Rueben Randle (New York Giants) will be visiting the Los Angeles Rams, the first of several scheduled visits. CBS Sports reports that unrestricted free agent left tackle Russell Okung (Seattle Seahawks) has contract offers on the table from the New York Giants, Pittsburgh Steelers, and Detroit Lions. The Seahawks and 49ers are also said to be interested in his services. Okung, who is representing himself in contract negotiations, met with the Giants last Friday. The 28-year old Okung was originally drafted in the 1st round (6th overall pick) of the 2010 NFL Draft. Okung needed left shoulder surgery to repair a dislocation suffered in the 2015 playoffs and reportedly is still recovering from that procedure. The NFL Network had reported that the New York Giants were one of three teams “in the mix” for the services of unrestricted free agent safety Chris Conte (Tampa Bay Buccaneers). But Conte re-signed with the Buccaneers on Sunday. ESPN reports that the New York Giants have expressed interest in unrestricted free agent linebacker O’Brien Schofield (Atlanta Falcons), but Schofield told the Giants “no thanks.” The Giants pursued Schofield in free agency two years ago, but Schofield failed the team’s physical at that time. Harry Hulmes III, who served in various roles with the New York Giants for 25 years, has passed away at the age of 88. Hulmes joined the Giants in 1984 as an assistant to then-General Manager George Young. Hulmes later became the special assistant to the general manager until 1998. From 1998 to 2008, Hulmes served as a scout for the team. 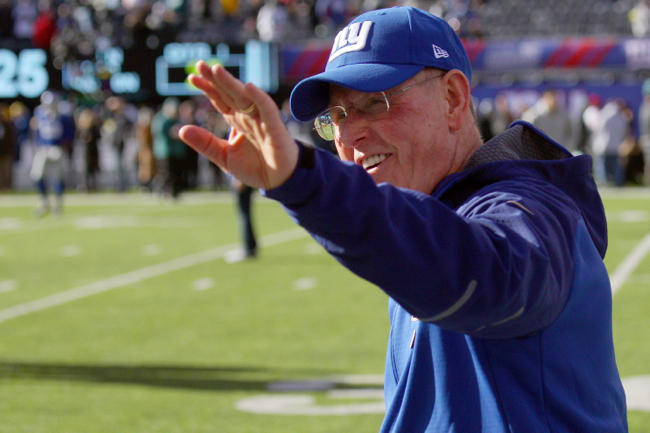 In a move that was somewhat expected, Tom Coughlin is stepping down as head coach of the New York Giants. 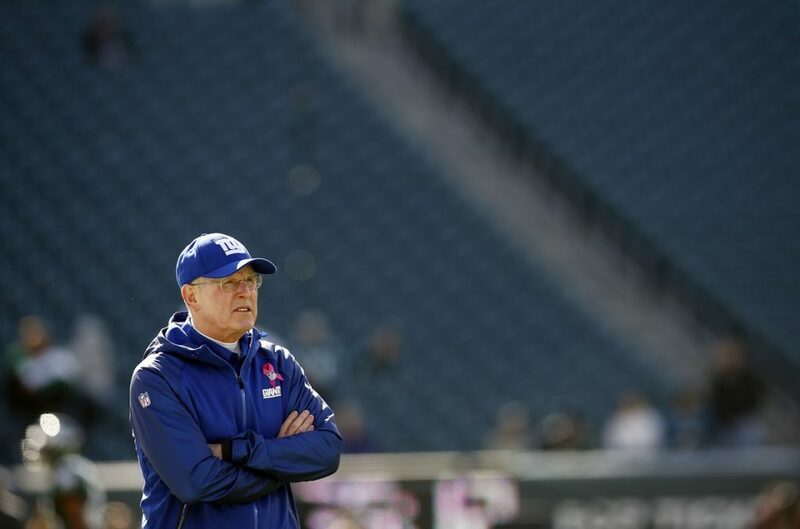 Coughlin served as head coach of the team for 12 seasons, guiding the franchise to five playoff berths, three division titles, two NFC Championships, and two NFL Championships. He coached the Giants to a 102-90 regular season record and 8-3 post-season record. Coughlin had more wins in franchise history of any coach except for Steve Owen. However, the team has had three losing seasons in a row and has missed the playoffs six times out of the last seven years. The Giants will hold a press conference on Tuesday morning at 10:30AM with Coughlin, team president/CEO John Mara, team chairman/executive vice president Steve Tisch, and team general manager Jerry Reese. “I met with John Mara and Steve Tisch this afternoon, and I informed them that it is in the best interest of the organization that I step down as head coach. I strongly believe the time is right for me and my family, and as I said, the Giants organization,” said Coughlin in a prepared press release. 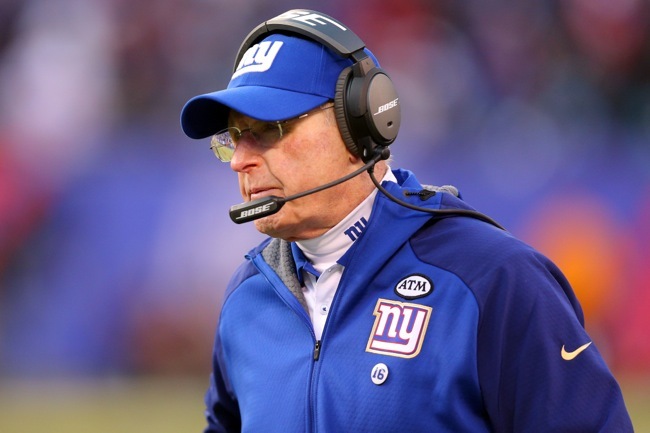 “It has been an honor and a privilege to serve as head coach of the New York Football Giants. This is a not a sad occasion for me. I have spent 15 years with this organization as an assistant and head coach and was fortunate to be part of three Super Bowl winning teams. A Lombardi Trophy every five years is an achievement in which we all take great pride. “Obviously, the past three years have not been what any of us expect, and as head coach, I accept the responsibility for those seasons. “I think it has been evident these last 12 years here how much pride I take in representing this franchise. I am gratified and proud that we were able to deliver two more Lombardi trophies to the display case in our lobby during that time. That is a tribute to our players and staff, and it was truly fulfilling to be the leader of those teams. “I appreciate the support of John and his family and Steve and his family, and of Jerry Reese and his staff. I think our organization is a great representation of what I mean when I talk about ‘team’. Mara, Tisch, and Reese also commented by press release. FOXSports is reporting that Coughin is not retiring and remains interested in coaching if the right opportunity presents itself. According to press reports, team ownership met in the morning before meeting with Coughlin at 1:00PM. Coughlin met with staff and players in the morning but did not share any insights about his status. He then met with the coaching staff after his early afternoon meeting with ownership. According to NFL.com, New York Giants General Manger Jerry Reese’s job is safe. He will not be fired. According to Comcast SportsNet Philadelphia, the New York Giants are said to be one of several teams interested in interviewing Chip Kelly for their head coaching vacancy. Kelly, who served as head coach of the Philadelphia Eagles from 2013-2015, was recently fired by the team. The other teams reported to be interested in Kelly include the 49ers, Browns, and Titans. 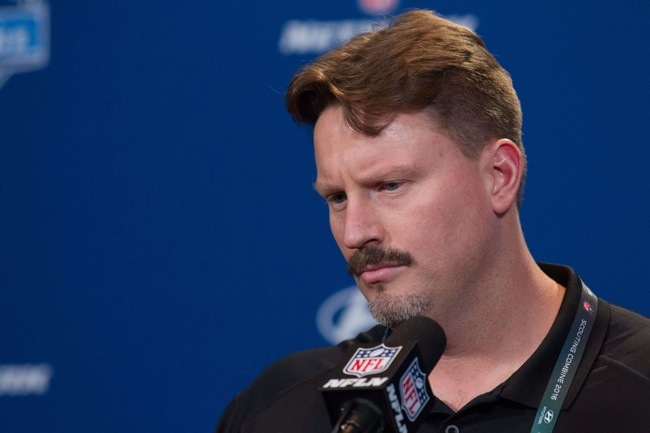 According to FOXSports, New York Giants Offensive Coordinator Ben McAdoo is one of several potential head coaching candidates for the Philadelphia Eagles. Chicago Bears Offensive Coordinator Adam Gase and Detroit Lions Defensive Coordinator Teryl Austin are also said to be drawing interest from the Eagles. According to CBS Sports, New Orleans Saints Head Coach Sean Payton is interested in becoming the Giants next head coach. Payton served as the offensive coordinator with the Giants under Jim Fassel from 2000-2002. However, the Saints are reportedly seeking a second-round draft pick for Payton. Eli Manning was about as emotional in the locker room talking about Coughlin as he's been in his 12 NFL seasons. "We failed him," he said. The New York Giants have signed wide receiver Ben Edwards to the 53-man roster from the team’s Practice Squad. Edwards fills the roster spot created by wide receiver Odell Beckham’s suspension. Edwards was eligible to play in the NFL in 2014, but sat out the year recovering from an ACL knee injury. The Giants originally signed Edwards after the 2015 NFL Draft, but waived/injured him in July after he pulled his hamstring during the June mini-camp. The Giants signed him to the Practice Squad in November 2015. Edwards lacks ideal size and timed speed, but he is a quick receiver who plays faster than he times. Edwards runs very good routes, adjusts well to the football, and has good hands. He has experience playing in the slot and returning punts. The Giants also re-signed wide receiver Julian Talley to the Practice Squad. This is Talley’s third stint on the team’s Practice Squad this season. Talley was originally signed as an undrafted rookie free agent by the Giants after the 2012 NFL Draft. Talley spent most of the 2013 and 2014 seasons on the team’s Practice Squad, although he did play in two games each season. He does not yet have an NFL catch. Talley is a tall, thin receiver with good overall athletic ability. He lacks ideal speed, but is smooth and fluid with good hands. Talley has gotten better each year. LT Ereck Flowers (illness), DT Markus Kuhn (knee), LB Devon Kennard (foot), LB James Morris (quad), and S Cooper Taylor (concussion) did not practice on Thursday. RB Orleans Darkwa (illness) and DE George Selvie (concussion) fully practiced. The transcript of Tom Coughlin’s press conference on Thursday is available in The Corner Forum while the video is available at Giants.com. There is no media access to the Giants on Christmas. The team will have a 45-minute, up-tempo “walk-thru” practice on Saturday that is not open to the media. The Giants play the Vikings in Minnesota on Sunday. The New York Giants have place tight end Larry Donnell (neck) and long snapper Zak DeOssie (wrist) on season-ending Injured Reserve. Donnell injured his neck on December 1st in a game against the New Orleans Saints and has missed the last four games. DeOssie had not missed a game in his 8-year career. He appeared on the team’s injury report on Saturday with the wrist injury but played in the game against the New York Jets. 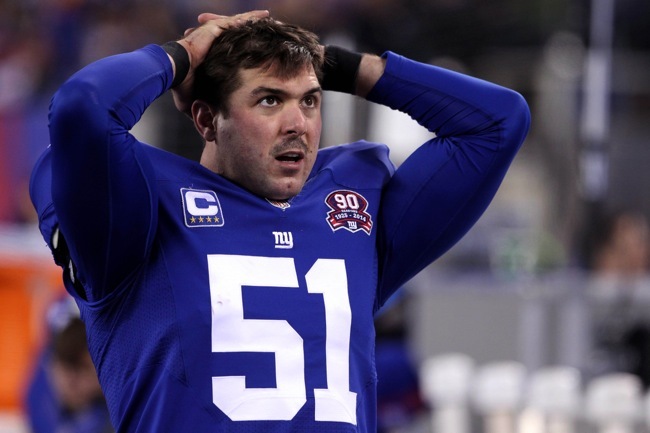 According to The New York Daily News, DeOssie has ligament damage in the wrist that will require surgery. To fill the vacant roster spots, the Giants signed cornerback Tramain Jacobs and long snapper Danny Aiken to the 53-man roster. 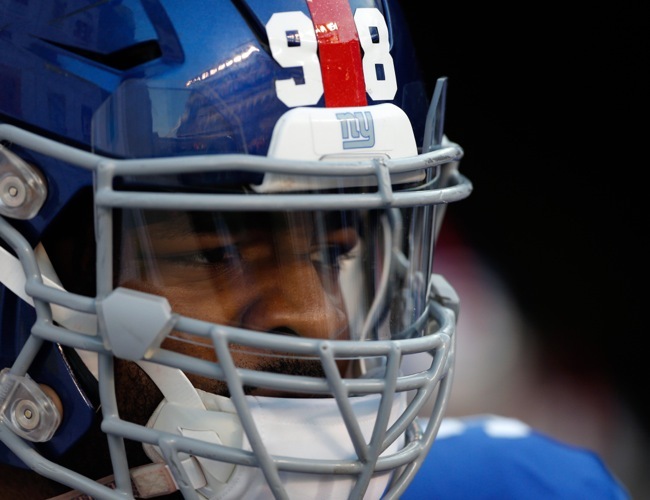 The Giants signed Jacobs to the Practice Squad in September, promoted him to the 53-man roster in early November, and re-signed him to the Practice Squad nine days later after he had played in two regular-season games. Jacobs was originally signed as an undrafted rookie free agent by the Baltimore Ravens after the 2014 NFL Draft. He played in three games as rookie after spending nine weeks on Baltimore’s Practice Squad. Jacobs finished the season on Injured Reserve with a thigh injury. The Ravens waived Jacobs in August 2015. Aiken was originally signed by the Buffalo Bills as an undrafted rookie free agent after the 2011 NFL Draft. Since then, he has spent time with Bills (2011), New England Patriots (2011-14), and Carolina Panthers (2015). He played in 63 regular-season games and 10 postseason games for the Patriots, including Super Bowl XLVI against the Giants. The New York Giants have signed offensive tackle Jake Rodgers and cornerback Leon McFadden to the Practice Squad. The vacancies were created when the Giants signed linebacker James Morris and cornerback Tramain Jacobs to the 53-man roster. Rodgers was originally drafted in the 7th round of the 2015 NFL Draft by the Atlanta Falcons. The Falcons waived him in early September. Rodgers is a developmental prospect with a nice combination of size and athletic ability. The Giants signed McFadden off of the Practice Squad of the Arizona Cardinals in October 2015, but waived him on December 5th after he had played in two games. McFadden was originally drafted in the 3rd round of the 2013 NFL Draft by the Cleveland Browns. He played in all 16 games as a rookie with two starts. The Browns waived him in August 2014. Since then, he has spent time with the Jets, 49ers, Cardinals, and Giants. McFadden played in seven games for the 49ers in 2014. The 49ers waived him in September 2015. The audio of Tuesday’s WFAN Radio interview with wide receiver Rueben Randle is available on CBS New York’s website. Wide receiver Odell Beckham’s 2,459 yards is the highest total ever for a player in his first 24 games. 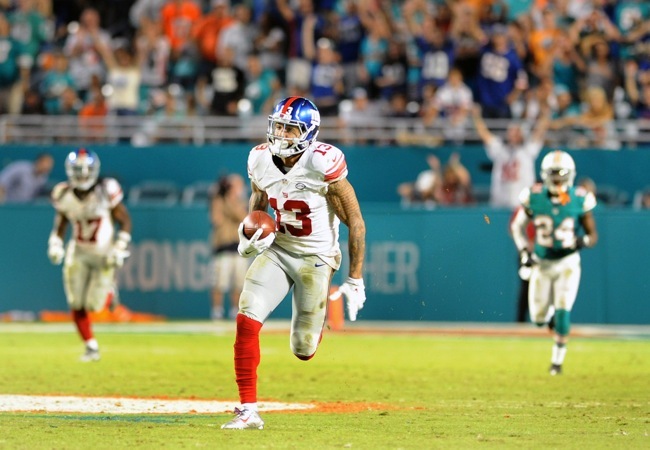 Beckham is the first receiver in Giants history with five consecutive 100-yard games. 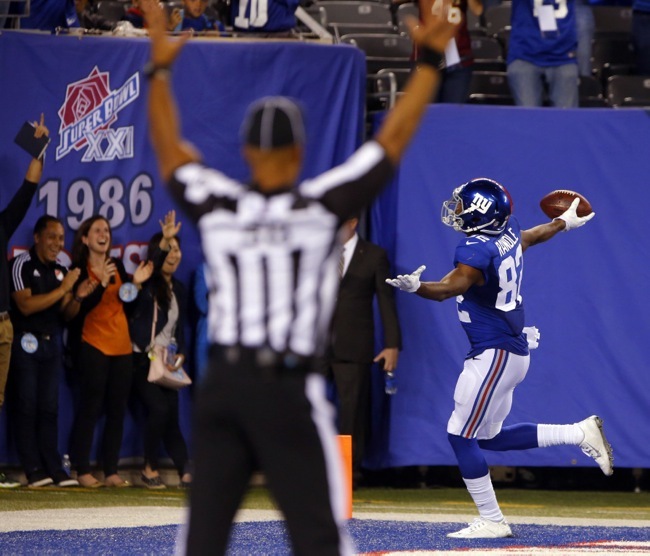 Wide receiver/returner Dwayne Harris became the first player in Giants history with touchdowns on a punt return, kickoff return, and a reception in the same season. Quarterback Eli Manning’s 72-yard touchdown pass to Beckham was his 14th career completion of at least 70 yards. The Giants have scored on all of them. 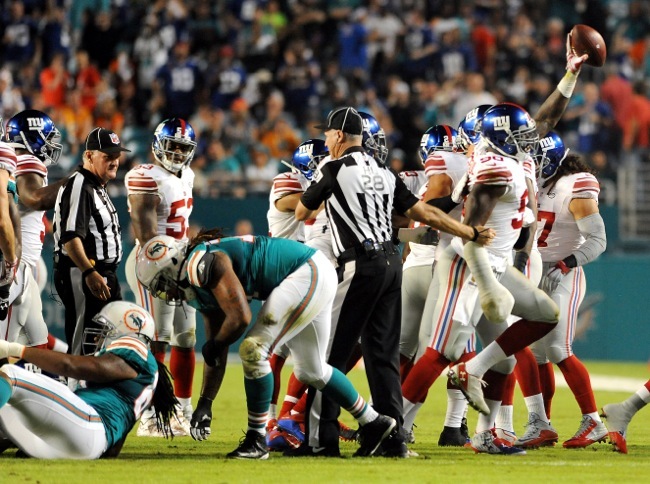 The Giants have rushed for at least 100 yards just twice in their first 12 games for the first time in their history. The players return to practice on Thursday to start preparing for Monday’s game against the Miami Dolphins.